We had some changes to our sea turtle team yesterday. We were sorry to loose Dr. Innis (read his earlier posts from the scene here, here, here and here) who had to depart for a previously scheduled research project. We sent him off in style with a late dinner in New Orleans at some famous little spot which I can't remember because the heat has stifled my memory. 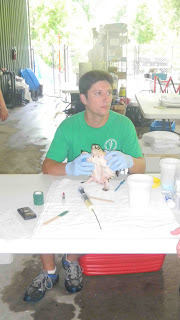 At the same time we welcomed a new member to our team, Dr. Shane Boylan, chief veterinarian at the South Carolina Aquarium. Some of you will remember my blog from last year when Kate and I visited our colleagues at the South Carolina Aquarium. 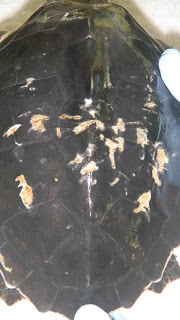 Dr. Boylan and I were happy to find the little hawksbill alive and active when we arrived yesterday. This little turtle does not do well if handled for more then 10 minutes or so. He stresses easily. Today was a big day as he needed a weight, a tube feed, a blood draw and an injection. We worked quickly and quietly, which he seemed to tolerate pretty well. We have not had new turtles come in during the past couple days so we used our time wisely to catch up on other diagnostics. 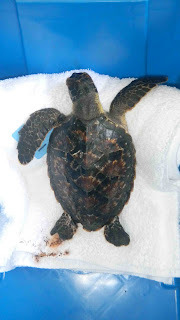 Dr. Cara Field from Audubon Aquarium of the Americas (AOA) and Dr. Boylan spent a few hours in the afternoon in Radiology getting radiographs of many of the turtles. This is an important diagnostic, we were happy to finally have a block of time to complete these. 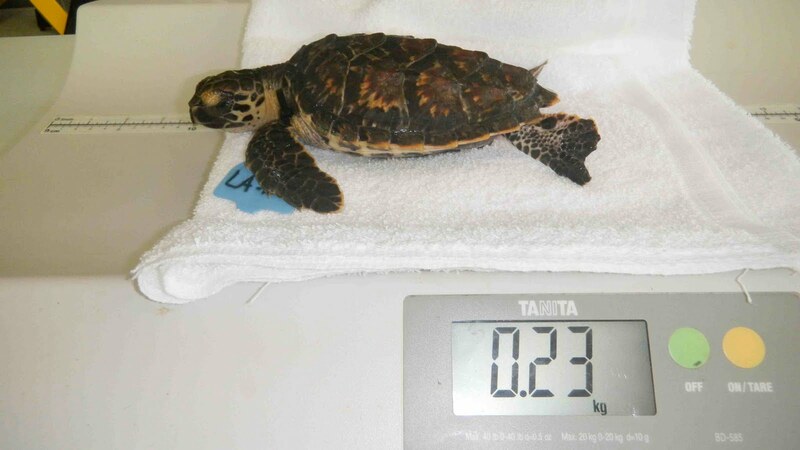 The photo on the left shows Dr. Boylan holding the little hawksbill after a tubing. Sea turtles regurgitate easily so propping them upright for about 10-15 minutes after a tube feed is standard practice, as shown in the photo on the right. This photo shows the little hawksbill on the scale. Look at that weight folks, he's only about 1/2 a pound! In addition to the oiling, a few turtles have come in with additional wounds. Below is a photo of the carapace (photo on left) and plastron (right photo) of the same turtle. We are flushing these wounds and applying medical ointment to promote healing and prevent infection. 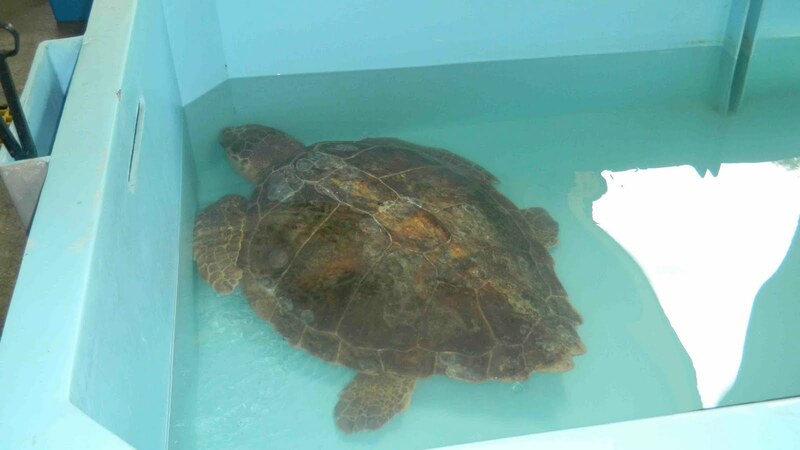 This is our largest patient, a loggerhead. She is improving well and eats like a champ! In addition to sea turtle care, the great staff at AOA are taking good care of the medical staff too! 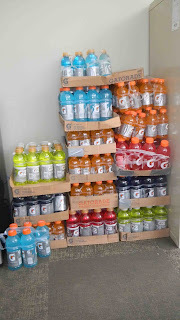 In this heat, electrolyte replacement is essential - check out the wall of Gatorade they provide for us! 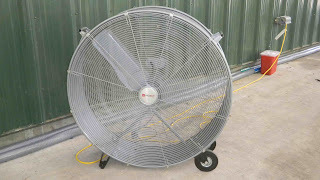 They also have giant fans set up to help keep us cool and provide some air flow. While working behind another team I quickly realized that these fans are great for blowing the sweat off the teams in the front directly onto the teams in the back...at 90 miles per hour! 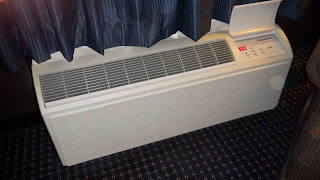 Below is a photo of the air conditioner in my hotel room - just thought I'd throw a photo in there since this is my new best friend. Heat index today will reach 112, I wonder if that's going to feel like a walk in the park after yesterday? Turtles continue to improve slowly but have a long way to go. We are seeing dark feces on occasion, which could indicate the presence of oil. We are collecting samples and sending them to the lab for analysis. We worry about oil that may be still in the systems of these animals and the effects which will result. We are proceeding with caution and doing everything possible to help these incredible, endangered and threatened species. that will cool you down! The work you're doing is truly inspiring - thank you SO much for blogging about it and keeping everyone up to date. Hang in there with the heat - just think of what a breeze your next summer up here in the northeast will be! Thank you for your hard work and dedication to the turtles!